It was a chilly night at the Dacotah Speedway as fans and drivers braved the cold on Friday, May 8th. The cold, windy weather didn't stop drivers from traveling as far as Gillette, WY or Manor, SK to come and race on the fast high banks. In fact, car counts were higher than opening night! Heat races were quick and fast so it wasn't long before the first feature race of the evening. Past IMCA Sport Compact Champion, Stan Thompson started on the pole for the 10 lap IMCA Sport Compact feature. Thompson bobbled on the start, allowing Nic West and Chance Seelye to race for the lead before Josh Roehrich muscled by to lead lap one. Roehrich pulled away as second place West got loose, quickly dropping from second place to tenth. Bismarck's Jason Berg moved up through the field quickly from his ninth place starting position to challenge fourth place Brandon Anderson. Berg was all over Anderson's rear bumper and they briefly raced side by side before Berg grabbed the position with five laps to go. Berg reeled in third place Chase Schlafman but ran out of time as Schlafman held on to finish third over Berg. Chance Seelye finished a career best of second place behind feature winner Josh Roehrich. Brandon Anderson rounded out the top five to finish fifth. From feature winner to pole sitter, Josh Roehrich started on the pole for the Hobby Stock feature. Roehrich had his hands full on the start as he tried to hold off a strong Keith McCleary for the lead. McCleary would take the lead on lap two before a caution would reset the field. Nathan Messer split McCleary and Roehrich on the restart and slipped by to take the lead before another caution slowed the field. On the restart, Messer distanced himself from the the hard fought battle for second place between McCleary and last week's feature winner Wyatt Rath-Wald. As the two Napoleon natives battled for second, fourth place Jaren Wald tried to hold off Wishek's Brent Vetter. Wald and Vetter raced side by side for several laps but Wald shut the door with five laps to go. Vetter rallied back and they continued to race side by side until Vetter finally completed the pass on Wald for fourth just before a caution would end the race just three laps shy of it's schedule distance. 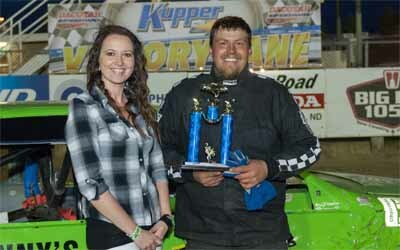 Due to an exceeded time limit, the race was called short which meant Nathan Messer had just won his first feature victory of his racing career over Wyatt Rath-Wald and Keith McCleary. 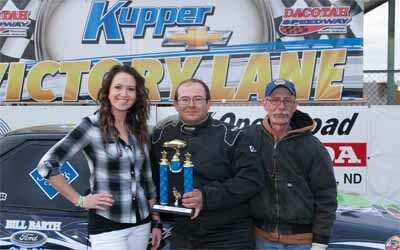 Steven Kuntz led the field to the green flag in the INEX Legends feature. Dauntae Martin trailed in second place as his brother Preston Martin tried to hold off last year’s track champion Donavin Wiest for third. Wiest would take the third position and quickly reel in second place Dauntae. They briefly raced door to door until Wiest slipped by to take second on lap five. A caution on lap seven regrouped the field and on the restart, Dauntae Martin retook the second position from Wiest. Wiest charged back a lap later and blew by Dauntae for second. Kuntz's lead quickly diminished as he tried to protect his lead from a hard charging Wiest. With three laps to go, Kuntz and Wiest raced side by side for the win. As the white flag waved, they continued to race side by side however, Kuntz got an amazing run off turn two and took the lead down the backstretch. Wiest dove low under Kuntz in turns three and four but Kuntz prevailed on the high side to pick up the feature win. Dauntae Martin finished third ahead of Troy Hoff and Preston Martin. Pole sitter Jeremy Schmidt pulled away quickly in the WISSOTA Street Stock feature. Kelly Hoerner, who started second, held onto second place while Matt Dosch and Brandon Beeter raced hard for third. Beeter, from Minot, passed Dosch for third before a caution slowed the field. On the restart, Hoerner, Beeter and Dosch raced three wide for second. Hoerner hung on to second while Barrett Berg slipped by both Beeter and Dosch to take third. Dosch was all over Berg's rear bumper and with three laps to go, Dosch completed the pass for third. A lap later, Brandon Beeter and his brother, Brock, slipped by Berg to finish fourth and fifth. 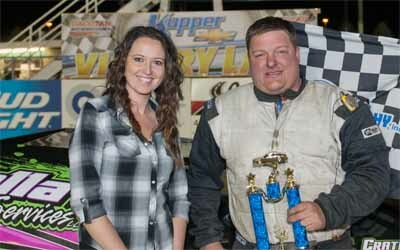 Kelly Hoerner finished a distant second behind a dominate Jeremy Schmidt who led all 20 laps to win. Dickinson's Jay Tooley started on the pole for the final feature of the night, a 25 lap IMCA Modified feature. Jason Wolla of Minot quickly blew by Tooley as brother Josh Wolla and Donald Robinson followed. Jeremy Keller passed Robinson for third before Robinson got too high in turn two, dropping from fourth to tenth. Fourth place Marlyn Seidler had his hands full as he tired to hold off a fast Mike Hanson. A caution on lap seven reset the field and on the restart, Keller passed Josh Wolla for second. 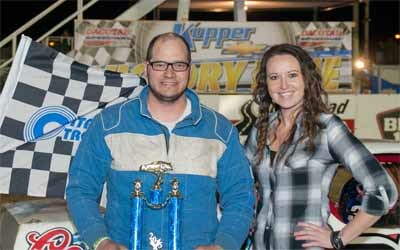 A series of cautions plagued the feature but it did not slow Jason Wolla down. On the final caution of the night with six laps to go, Jason Wolla pulled away from the field once again. The battle was for fourth between Seidler, Masen Big Eagle, Shawn Strand and Jason Grimes. Strand passed Big Eagle and Grimes with only a few laps remaining. Grimes passed Big Eagle with two laps to go and challenged Strand. Strand held off Grimes to finish fifth behind Seidler. 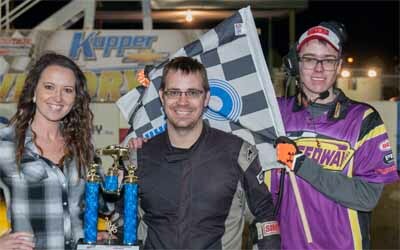 Josh Wolla finished third while Jeremy Keller finished over one second behind feature winner Jason Wolla. This Friday, May 15th is General Equipment Late Model night at Dacotah Speedway. Friday’s race will feature WISSOTA Late Models, IMCA Modifieds, WISSOTA Street Stocks, Dacotah Speedway Hobby Stocks and IMCA Sport Compacts. Track and national points will be awarded in all classes!